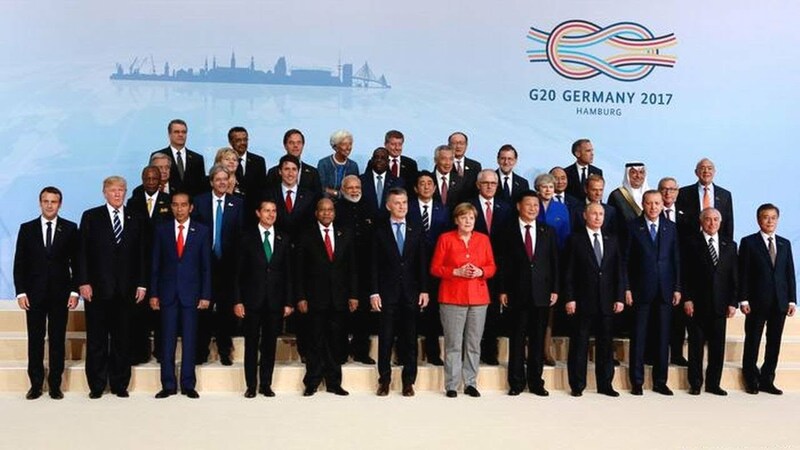 The Group of 20 (G20) is a group of 19 of the world's largest economies and the European Union. The G20 was formed in 1999 as a forum for member nations to discuss important economic issues of the world. In this article we will have a brief look on G20 and its working. P.S. This is a follow-up to our earlier article on G7 which you can read by clicking HERE. The members of this group are Argentina, Australia, Brazil, Canada, China, France, Germany, India, Indonesia, Italy, Japan, Mexico, Russia, Saudi Arabia, South Africa, South Korea, Turkey, the United Kingdom, the United States and the European Union. The member countries are represented by their respective Heads of the State and by their respective Central Bank Governors and the European Union is represented by the European Commission and by the European Central Bank. The G20 group account for around 85% of the gross world product (GWP), 80% of world trade, 66% of the world population, and approximately half of the world land area. The heads of the G20 nations met twice an year at G20 summits between 2009 and 2010. Since the November 2011 Cannes summit, all G20 summits have been held annually. Mauricio Marci, the President of Argentina is the current Chairperson of the G20 group because Argentina will be hosting the 2018 G20 Summit in November. It was founded by the G7 members at the G7 Finance Ministers' meeting on 26 September 1999. Canadian finance minister Paul Martin was chosen as the first chairman and German finance minister Hans Eichel hosted the inaugural meeting. The first G20 summit was held in Berlin on 15-16 December 1999 and was hosted by the German and Canadian finance ministers. Since then, there have been 20 G20 meetings between finance ministers and central bank governors, and 11 summits between heads of state or governments. The first leaders' Summit took place in 2008 in Washington D.C., United States. Some guest countries are also invited in the summits. The G20's primary focus has been governance of the global economy. New chairperson is chosen every year through the chair rotation system. All 19 sovereign nations are assigned to one of five different groupings. Each group holds a maximum of four nations. This system has been in place since 2010. The chair is part of a revolving three-member management group of past, present and future chairs, referred to as the "Troika". In 2017, the chair was Germany, in 2018, it is Argentina and in 2019, it will be Japan. Guinea, Netherlands, Switzerland, Spain, Norway, Senegal, Singapore and Vietnam were guest countries. Along with regular topics of discussion like global economic growth, international trade and financial market regulation, "issues of global significance" like migration, digitisation, occupation, health, Women's Economic Empowerment and development aid, terrorism, free trade, condition of Africa and the United States' withdrawal from the Paris Agreement were also on the agenda. This year's Summit will be held on 30 November - 1 December. The future of work, infrastructure for development and a sustainable food future are the expected topics of discussion. A number of attending countries have said they will focus on the regulation of crypto-currencies at this meeting. On 23-24 August, representatives from G20 member and guest countries, together with leaders of international organisations, will take part in the G20 Digital Economy Ministerial Meeting in the province of Salta, in the north-west of Argentina. The benefits and challenges posed by digital transformations in Salta would be discussed. Exclusivity of membership is always criticised. Despite being hit hard by the economic crisis after 2008, Spain is still the world's fourteenth largest economy by nominal GDP (the 5th in the European Union) and sixteenth largest by purchasing power parity, clearly exceeding the numbers of several current members of the G20 such as Argentina or South Africa. But still Spain is not a member of G20. In a 2010 interview with Der Spiegel, the Norwegian foreign minister Jonas Gahr Støre called the G20 "one of the greatest setbacks since World War II." Although Norway is a major developed economy and the seventh-largest contributor to UN international development programs, it is not a member of the EU, and thus is not represented in the G20 even indirectly. There are no formal votes or resolutions on the basis of fixed voting shares or economic criteria. US President Barack Obama dominated the 2014 Brisbane summit, placing climate change at the top of the agenda, despite the reluctance of host nation Australia’s then Prime Minister Tony Abbott to allow the issue such pride of place. So "Do all member countries exert equal influence?" is a question often raised by critiques. The fact that there is no permanent Secretariat is also criticised. G20 summits have also been a focus for major protests by left-wing groups and anarchists. Read more about the G20 at the official G20 website by clicking HERE.